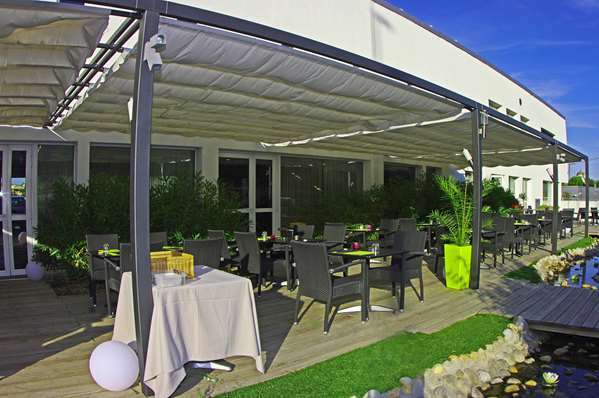 Here, you will find all the comfort of a 4-star hotel restaurant located in the heart of a very charming region. Whether you're stopping by on a family vacation or friends or you're on a business trip, our hotel has all the amenities needed to ensure you have a pleasant stay. 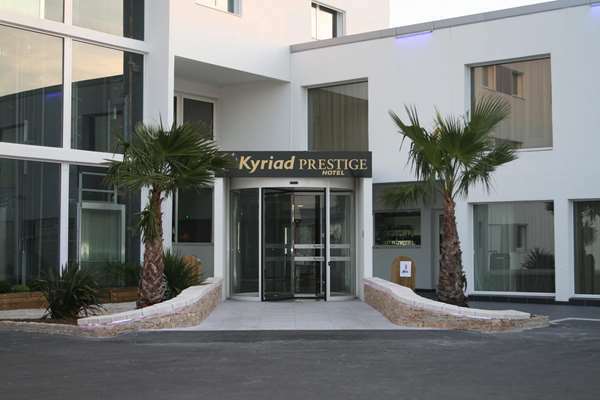 Your Hotel Kyriad Prestige Montpellier Ouest - Croix d'Argent is ideally located for you to explore Montpellier and the surrounding region. 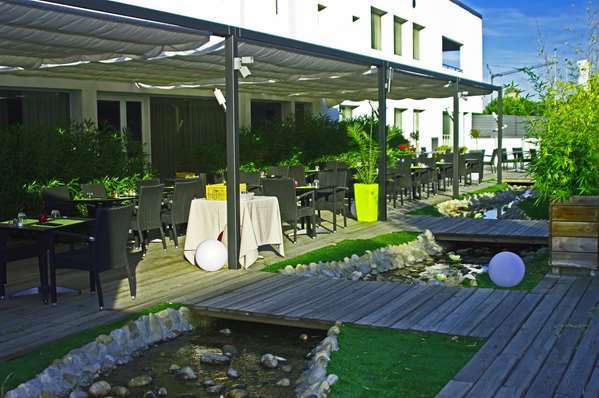 Easily accessible from the highway, the hotel is close or the Grande-Motte and Palavas-les-Flots beaches as well as the southern Cévennes areas. The famous Place de la Comédie and the city center are also nearby. 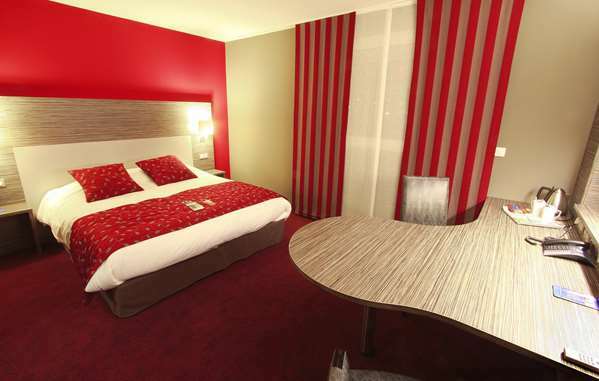 From the hotel, you can reach the airport and the TGV train station quickly by car. 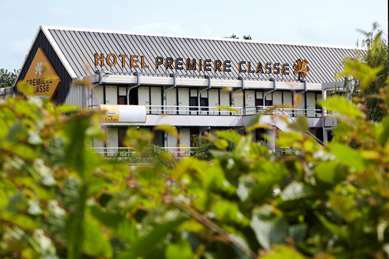 Our recently constructed hotel has 100 spacious air conditioned rooms. 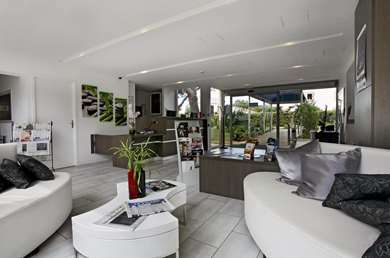 Four rooms are specially adapted for people with reduced mobility. 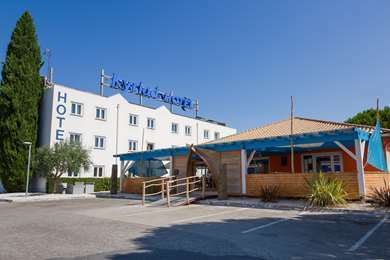 All rooms have quality bedding, en-suite bathrooms, a free Wi-Fi connection and a flat-screen TV. 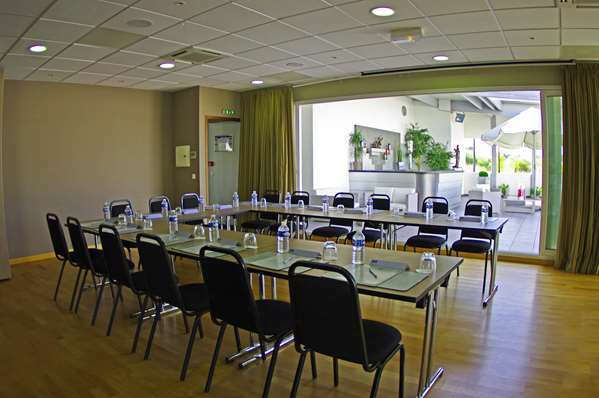 Some rooms are equipped with work spaces for your business meetings and appointments. 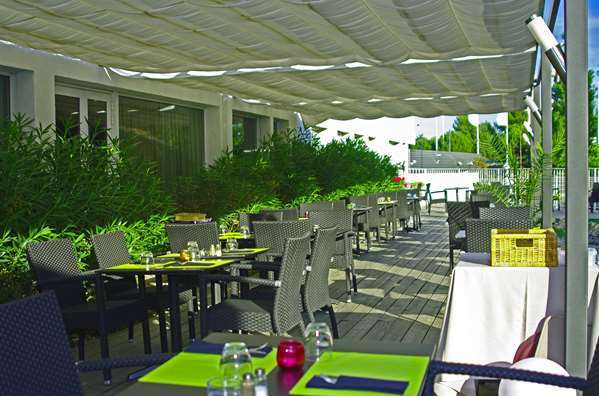 Would you like a gourmet break? 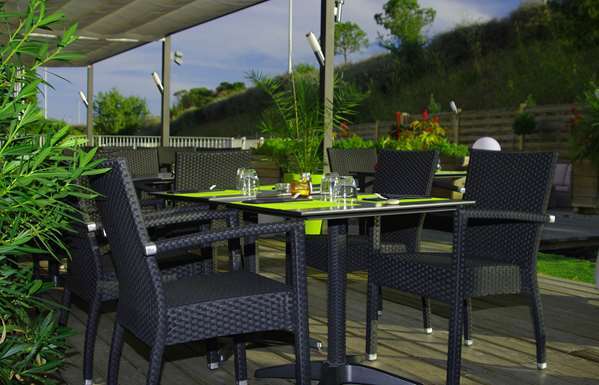 We welcome you every day in our restaurant for all meals of the day. Would you like something more? 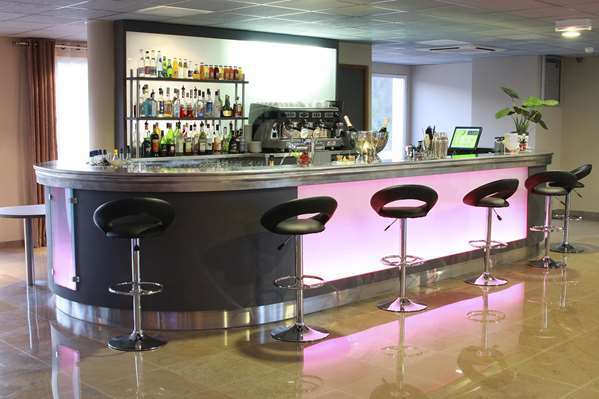 Every Wednesday why not meet us at the piano bar: for guaranteed fun and relaxation! We offer all the amenities you need in our 4-star hotel where everything has been designed to make sure you have a pleasant stay. Our teams welcome you 24 hours a day in French, English, Italian, Spanish, German and Portuguese. 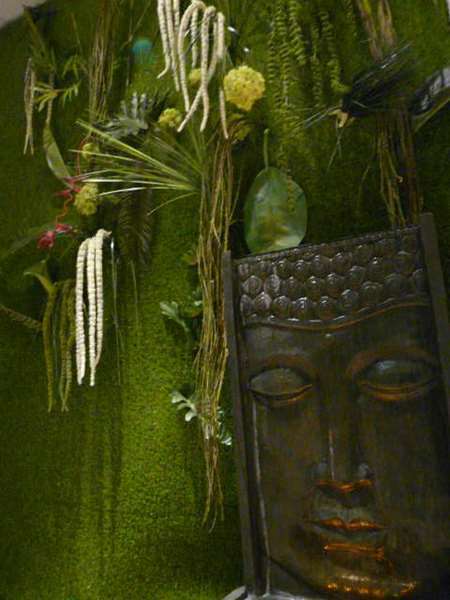 Our decor is modern and contemporary and we offer personalized hospitality. You can go swimming in our indoor or outdoor swimming pool and enjoy the fitness area with steam room, sauna, Jacuzzi, massage, and even Zumba classes. 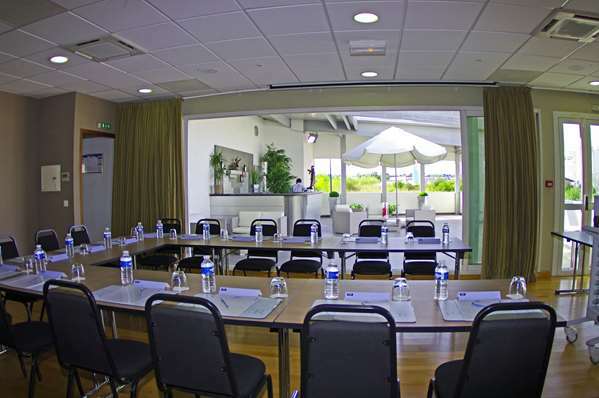 Our modular, functional and pleasant meeting rooms are also available. 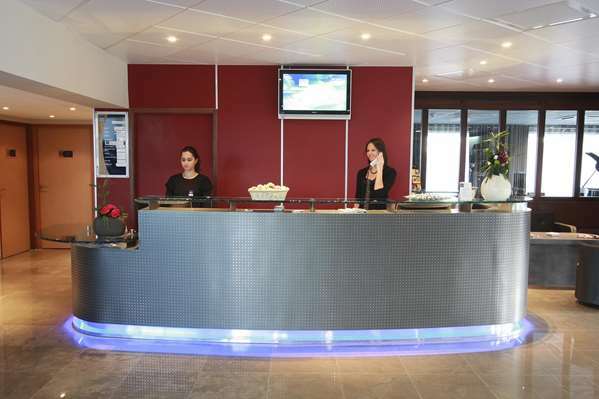 Don't hesitate to call our reception for more information. 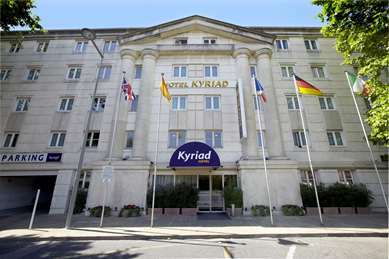 We hope to see you soon at Hotel Kyriad Montpellier Ouest! Many amenities Our 75 226 sq. ft. rooms (doubles or with two single beds) are all equipped with walk-in showers and angled bathtubs as well as soft bedding with a duvet. 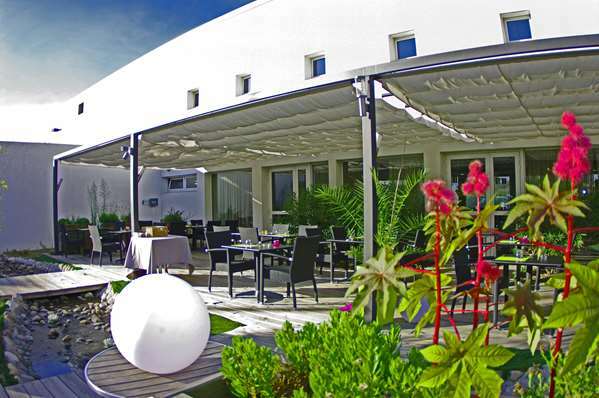 All rooms have air conditioning, a flat-screen TV, free Wi-Fi, telephone and a minibar. Our 25 "business" rooms measuring 377 sq. ft. also have a fully equipped desk space. 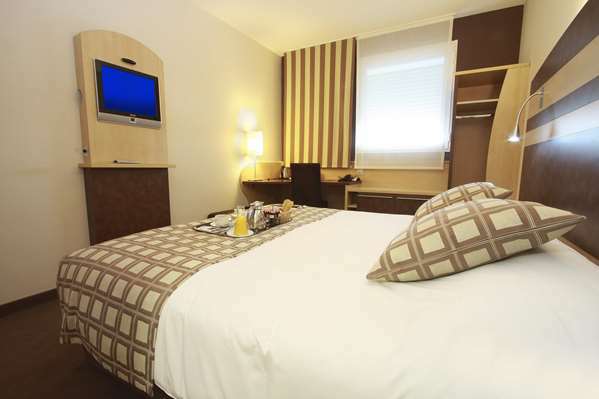 You will also enjoy our king-size bed. • Free private parking and underground garage. • Room service breakfast (for a fee). Our well-being lounge is a space with water that is devoted to rest and relaxation. 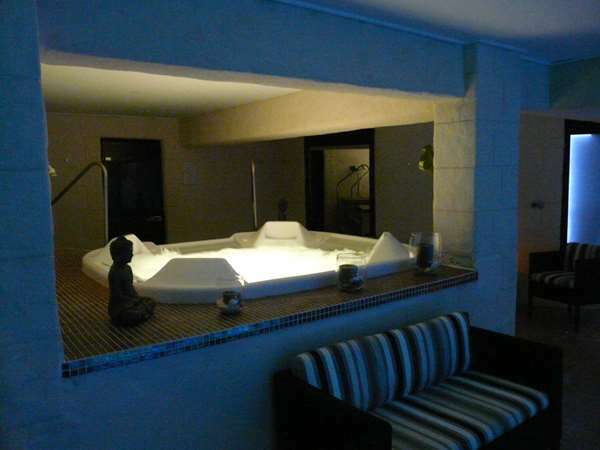 It has a hammam, sauna, Jacuzzi, and indoor swimming pool with swimming against the current, waterfall and hot tub. You can also take advantage of our "Elements" space, which is a place of relaxation where you can listen to the sounds of water, wind, earth and fire and take advantage of breathing sessions in an atmosphere scented with organic essential oils. 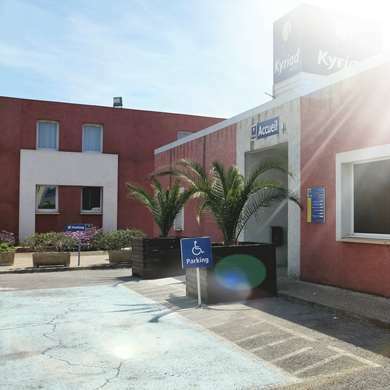 This Kyriad hotel is situated in an business zone outside Montpellier, with excellent access to the highways, but too far to visit Montpellier center properly (choose the other Kyriad in the center). 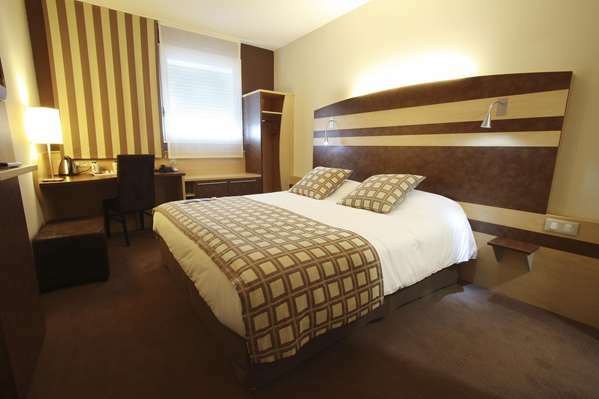 Rooms are nice and clean, very helpful and friendly staff. 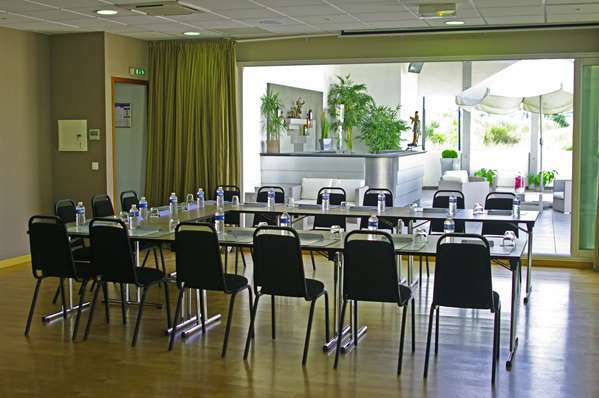 Possibilities for meetings. 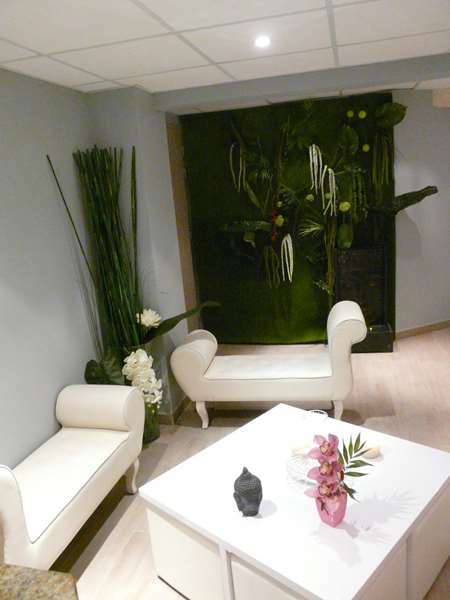 Wellness area available. Decent breakfast and good food. Spending there 3 nights offers good insight in train schedule and traffic peek period so the window shall be closed if you're going to have some peace. Each day faced the problem of keycard so I done some recreation going from 2nd floor to reception and back. Breakfast was ok but refilling the dishes and food takes a lot of time so taking everything into account the price of 120 € is a bold one. 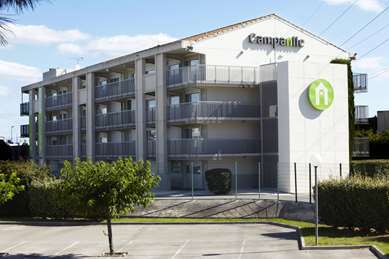 We stopped overnight on our way from England to Spain - the hotel was close to the motorway. The hotel staff were friendly and helpful. The room was clean and fine for a one night stopover. The hotel had a singer in the bar pre dinner - very nice. The restaurant was very good for dinner. The service was very good. Breakfast was also good. We will be staying here again. Located in industrial lane, with underground parking. Room modern and well decorated... bathroom clean and nice. This hotel was a steel... Great price but the location was a bit out of town. That was my fault for not researching it better. 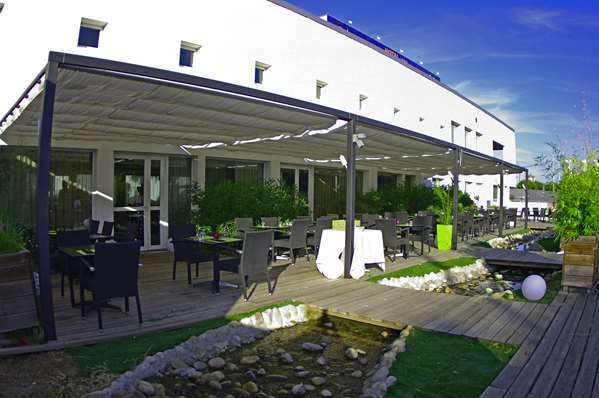 But I was looking for a hotel with Parking and this one had it and free, The foods int he dining room was very good. Breakfast was good too.